Yesterday morning the casket of, Justice Antonin Scalia, was brought into The Supreme Court Great Hall. A very sad day and a great loss to our Nation. 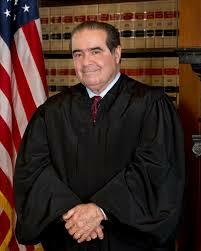 As I think about Justice Antonin Scalia, I think of a great man who served his country like no other. He loved, America, without reservation and so loved the Constitution and our Fore Fathers before us. He protected America by using The Constitution as his guide. Justice Antonin Scalia will go down in History as one of the greatest Justices who served on The Supreme Court. He left a Legacy to all of us that said, The Constitution should be followed without addition or obscure interpretation and must never be changed. We, The People, must vote out the people who speak against The Constitution. They are the spoilers that want to diminish our America as we know it. I have made this poem available for the loved ones who have passed and were also pillars in your life. This poem is available in print at Poetry by Penelope. What a thoughtful tribute! So relieving that there are still well-meaning people in power, so sad when they pass. May he rest in peace. Beautiful Poem/Dedication for the Wonderful Justice Scalia. Thank You! Scalia was the champion of Our Constitution and will be greatly missed.